Work on claims management and user account management activities. Work with the security components in a web service, specifically claims management and user account management activities. In a new security-aware app, we start with the claims and user management foundations that we learned about this week. Then, we will add to the foundations, and implement a few common use cases. For this assignment, we will not be creating entities for data, other than what’s needed for claims and user account management. DPS907 students must complete a few additional use cases. Create a new web service, named Assignment8. It will use the Visual Studio standard ASP.NET Web Application template, for a Web API app, with Individual User Accounts authentication. Build/compile (to make sure that there are no errors). Run, and ensure that the response from /api/values is HTTP 401. The AppClaim design model class (and its DbSet<TEntity> configuration); it is OK to add it to the IdentityModels.cs source code file, or you could put the code in a design model classes source code file. The AppClaim_vm.cs source code file. The AppClaimsController source code file. The Manager.cs source code file. The user account management resource models source code file. The user account management controller source code file. Before continuing, decide what claims will be on the “master list” when the app runs for the first time. Note that this is NOT a coding task. It is a thinking task, that results in a decision. Document your decision (write it down or put it in a digital note). You will use this info soon. What claims should you have? Well, we should have claim types OU and Task. What values? Let’s think about the music business example again (the one that uses the Chinook sample database). We will not be using its data or database, but just the ideas or concepts from the music business. Think of (and document) five (5) OU claims, and five (5) Task claims. For the OU claims, think about the music business. If you have to do a bit of research or learning, go ahead and do that. What kind of organizational units are you likely to find in the music business? Figure out five (5) of them. Use proper case for the values (be neat and tidy). For the Task claims, what kind of tasks or activities can be done in the app? For example, edit customer info? Figure out five (5) of them. Use proper case or camel case for the values (again, be neat and tidy). 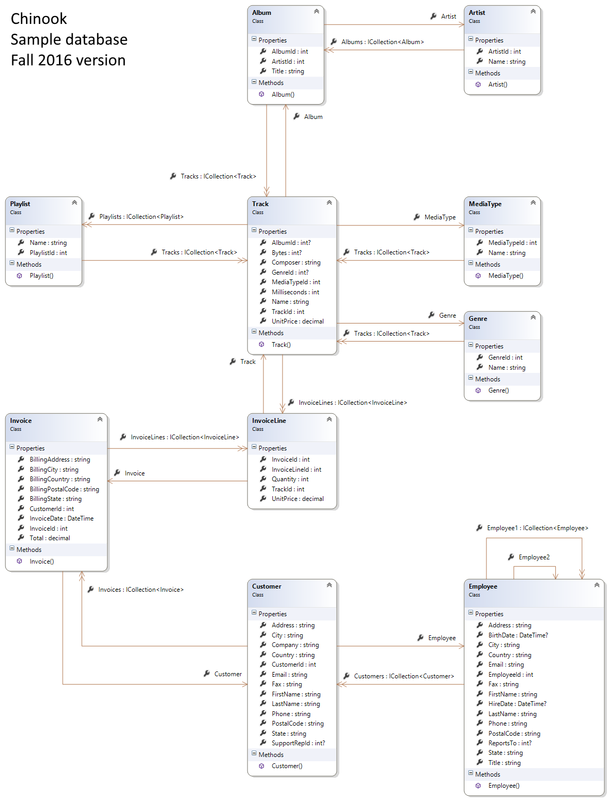 For your reference, here is the Chinook sample database class diagram. From the Week 8 ManageUserAccounts code example, add the IdentityInitialize.cs source code file to your project. Yes, you have permission to use this file as-is (and modify it in the future). If you wish, you can add more code, to create more user accounts. Add a method to the IdentityInitialize class, which will add the claims that you documented above. As suggested by the comment in the code example, get a reference to the manager object, ask whether there are any claims, and if not, add them. Remember to call this method from your code. At this point in time, build/compile (to make sure that there are no errors). Then, run the app again. This time, the data store will be initialized, because of the calls to the methods in the IdentityInitialize class. Sometimes a claim type or value on the master list would need to be updated. Maybe with a type or value change, or a description change. Look at the design model class, and decide which properties can be updated. Use common sense. Implement this capability. It will need (as any edit task needs) a resource model class, and logic to handle the update. At some point in time, we may want to delete (or more accurately, “retire”) a claim on the master list. In typical use, we do not really want to delete the actual object, but we don’t want to use it any longer. Look at the design model class, and you will notice a “DateRetired” property. That should be updated. The controller method can be coded as a “delete” method. Then, its manager method can (as noted above) update the “DateRetired” property. Create a standard Web API controller that you can use to test your work as you complete it. Name the controller A8Test. By now, you are familiar with the process: The RegisterBindingModel and the AccountController classes need edits to support additional claims. Make the edits to both. Use the guidance and code examples from weeks 7 and 8 to complete this task. The code example Register() method in the Account controller validates role claims. You must write code to validate the custom claims. As a reminder, the Register() method is designed to accept either JSON or HTML Forms data. If you are sending JSON, then a string collection can include the equals sign as-is. However, if you are sending HTML Forms data (content type is x-www-form-urlencoded), then you must encode the equals sign (as %3d). More information about this… If we had an HTML Form in a browser, entering a custom claim that includes an equals sign (e.g. OU = Cowborts) will automatically get encoded by the browser before it sends the request. In the request body, you will be able to see the %3d encoding. When the request is received at the server, the model binding part of the request-processing pipeline decodes the %3d back into an equals sign, as it writes the value of the string property. When you are writing code to decode and validate the custom claims, you will be looping through the CustomClaims collection in a way that’s similar to the role claims processing. It is possible that the user/requestor will attempt to send bad data. For example, a Type=Value pair that does not have one of the parts (Type or Value). The data would still be a valid string, so the model binder will correctly place the submitted data into a string property. However, you must test/check to ensure that the result is a Type=Value pair. How would you do that? Well, the value of each custom claim should be a Type=Value string. You must break the string apart into the “ClaimType” part, and the “ClaimValue” part. Use the string Split method to do this easily – the result will be a two-element array. Take a moment to read the documentation, and the first overload. The return type will be an array of one or more elements. We’re looking for exactly two (2) elements. If not two, then the custom claim string is NOT valid, right? Make sure that you “clean” the result, by using the Trim() method. As you know, the ManageUserAccounts code example included some use cases for user account management tasks (get all, get one by email address, etc.). In this part of the assignment, you will add support for more use cases. For this use case, we are interested in all users with a specific claim. For example, all users with the OU=Cowborts claim. That should be reasonably easy to complete, because it’s very similar to an existing “get all users by surname” use case that’s in the code example. Notice that we’re interested in the claims in the user accounts for this use case. Not the claims on the master list. That alone will make it difficult to get “all claims”. So, we’ll have to think about a different strategy. We can get some claims however, on a per user account basis. So, maybe we can somehow assemble the data that we need, by going through the user account collection. Let’s look at this, to see whether there’s a solution. Assume that we get the claims for the first user. Great – now we have a collection of claims (e.g. allClaims). Are they equal? Maybe, because both have a ClaimType of “…role”, and a ClaimValue of “Student”. But are they really equal? No, because the Id and UserId property values are different. The result of the Union statement above will be the same as with Concat, because the objects will in fact be different. So… can we consider them to be equal when we compare them? Yes. If we create a custom class that does the comparison, then the Union method can use that custom class. The comparison can be done only on ClaimType and ClaimValue. Then, we get a clearer result, with no “duplicates”. As you can see, the method returns a collection of MSClaimBase objects. They have extra properties that we don’t really need, Id and UserId. We can get rid of these. How? Create a resource model class, maybe named MSClaimList. It has only the ClaimType and ClaimValue properties. Then, return a collection of MSClaimList objects. For example, all users who do NOT have the “Employee” role claim. The result will be what you want. Earlier, you learned that the extension methods in the IEnumerable<T> interface included some set-oriented methods. Look at them – maybe “Except” will do the job. This is a common situation in real life within organizations, and it’s a good opportunity to write a code solution for it. For example, assume that you have the email addresses for a set of users, who all have the Task=PlaylistAdd custom claim. As a result of a management and department personnel change in the organization, a new claim must be added to each user in the set. Implement this. Make sure that you remember to fetch/retrieve the users you want to work with into an in-memory collection, before you query and process a user account. However, remember that the in-memory collection will not be live/linked to the data store, so you will have to take a collection object’s identifier and use that to interact with the ASP.NET Identity API. Also, make sure that you remember to validate the new claim against the master list of allowed claims. Then (like you’ve seen before), you can test result.Succeeded if you have to.